Product prices and availability are accurate as of 2019-04-18 16:55:48 UTC and are subject to change. Any price and availability information displayed on http://www.amazon.com/ at the time of purchase will apply to the purchase of this product. PuriTEST Brand Your order is shipped within 24 hours (Monday-Saturday)! Bottles are fresh, new and sealed! JSPTM GOLD TESTING SOLUTIONS This solution allows you to EASILY determine if your gold is real or fake! Simple 3-Step Testing Instructions Included! 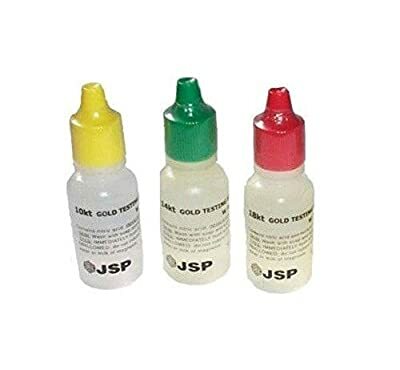 Qty 1: Single Bottles of 10k Gold Testing Solution Qty 1: Single Bottles of 14k Gold Testing Solution Qty 1: Single Bottles of 18k Gold Testing Solution The bottles of acid are less than two weeks old and comes sealed. The bottles are designed to easily dispense one drop at the time. The 0.5 Ounce Bottle contains enough acid for hundreds of tests! Most of our competitors are small time and will sit on their acid for 4-6 months since they don't sell enough volume to purchase wholesale often. We sell over 2000 bottles of acid a day through Ebay and Amazon! No one can offer acid as fresh as ours simply because no one else sells as much as us. RETURN POLICY: IF YOU HAVE ANY PROBLEMS, JUST SEND IT BACK WITHIN 30 DAYS AND WE'LL GIVE YOU A FULL REFUND. Please message me with any questions! I will be happy to call and explain things to you!